This Pre-Cruise Qwik Tour is perfect for pre-cruise passengers! 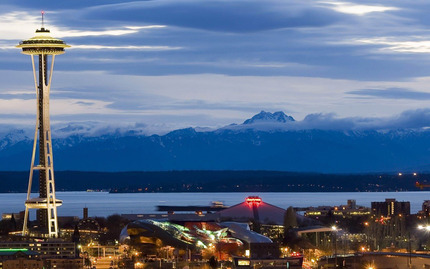 If you are scheduled to leave Seattle on a cruise ship to Alaska, please don't miss out on seeing this beautiful city. During the 90 minutes you will journey to some key sightseeing spots, from the Space Needle to the Sleepless House, and from Central District to Chinatown all while laughing along with energetic, humorous, and knowledgeable guides. Be sure to bring your camera for photo opportunities along the way, and enjoy this theatrical tour experience around this beautiful city. The bus will pick you and your luggage up from the hotel, and deliver you to your ship when the tour is over. Note: This tour picks up at all downtown, Lake Union and University of Washington area hotels only, and 2nd & Pike St. (Target store). Airport guests take light rail in to downtown and debark at the Westlake Center (last stop) for pick up. When booking, please indicate in special requests box your hotel pick-up location. Please indicate also your Cruise Terminal Dropoff: Pier 66 or Pier 91. Customers will receive a full refund within 24 hours notice of cancellation. Customers will also receive a full refund in case of operator cancellation due to weather or other unforeseen circumstances.